If you want to improve your website conversion rate it’s essential that you understand the behaviour and motivations of your visitors. If like me you run a start-up and have a very limited budget you might think you can’t afford user experience analytics and customer feedback tools to evaluate how well your website is performing. Indeed, when I worked for a large online gaming company we spent tens of thousands of pounds a month on the behavioural analytics tool ClickTale. However, before the ClickTale contract was due for renewal I came across a new behavioural analytics and customer feedback solution called Hotjar. By switching to Hotjar I saved the company over £100,000 a year. 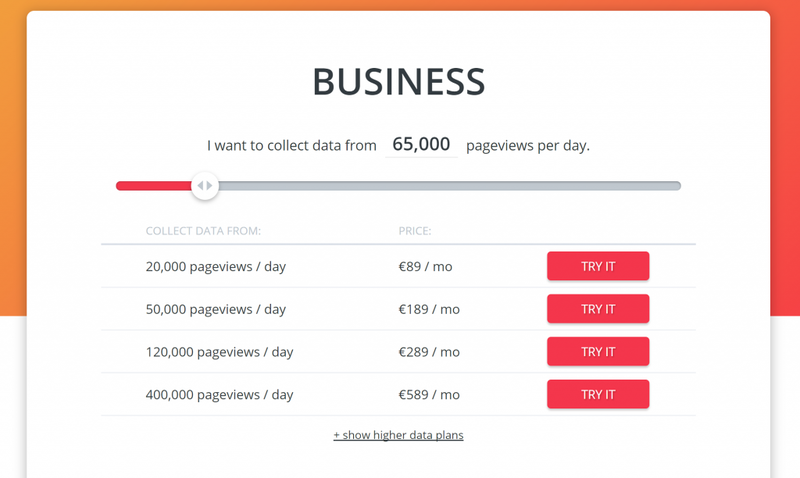 Further, if your website has less than 2,000 page views a day you can get Hotjar for free. 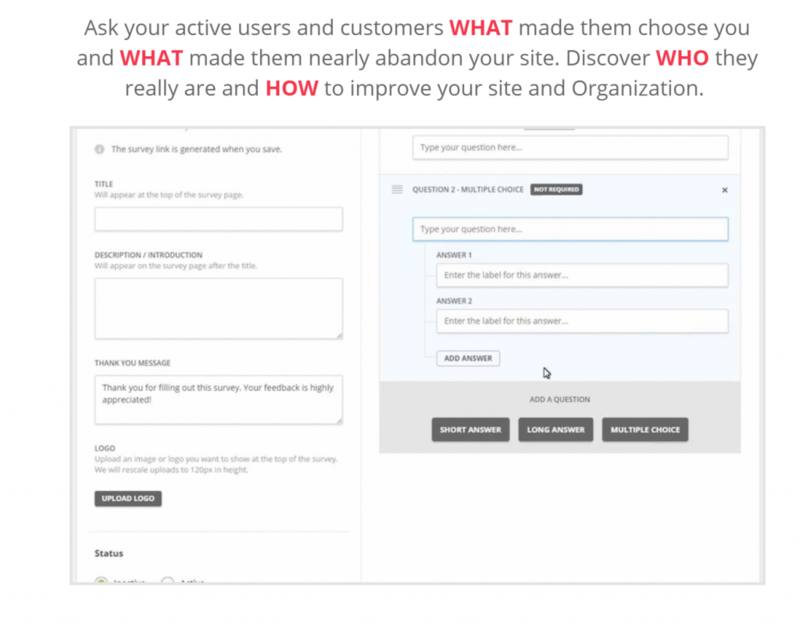 Hotjar is a combined user experience and customer feedback tool. It offers most of the features you would expect from a behavioural analytics solution including browser recordings of users navigating your site, mouse movement/clicks heat maps and form analytics. However, unlike most such tools Hotjar also offers customer feedback tools including on-site feedback polls, online surveys and research recruitment. It also has a very simple and intuitive user interface. It’s a very easy tool to start using and does not require hours of training to get the most out of it. The above dashboard allows you easily navigate to all the features that Hotjar offers and there is a clear on-boarding process to get you stared. How easy is it to add Hotjar to my site? The basic free plan is available for sites with up to 2,000 page views a day. For start-ups with up to 10,000 page views a day you can get the Hotjar Peronal Plan for just €29 a month. However, for more established businesses there are a range of more comprehensive plans outlined below. 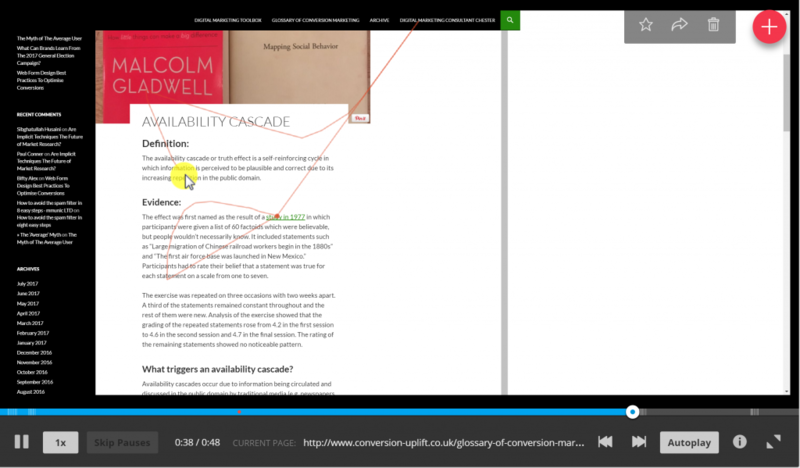 Browser recordings are like an undirected usability test. The feature allows you to record and replay a visitor’s session so that you can view what they see in their browser as they navigate around your site. These recordings are a fantastic way to observe how your customers move around and navigate on your site. They can help you identify where usability problems exist as they show clicks, scrolls and movements. You can also tag individual recordings giving you the ability to categorise them according to an observed behaviour or characteristic (e.g. added to basket or struggled with CAPTCHA). Click, scroll and mouse movement heat maps can be created in Hotjar by simply entering the page URL and specifying the limit of page views you wish to capture. 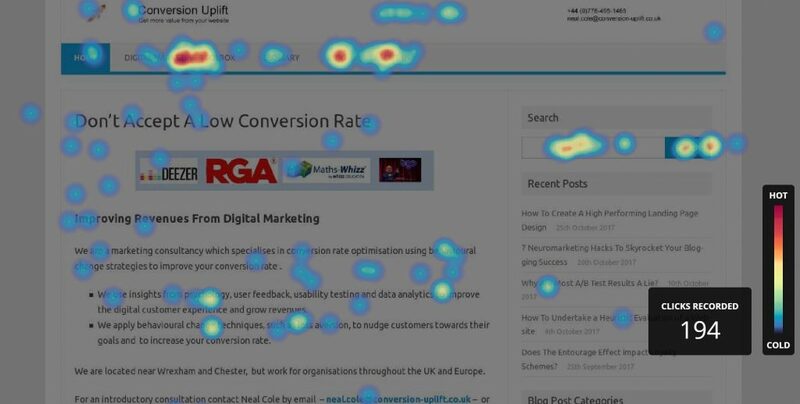 Heat maps give you a clear indication of where user attention is focused on your page and will show you how far down the page visitors are scrolling. Hotjar allows you to generate heat maps for desktop, tablet and mobile devices. 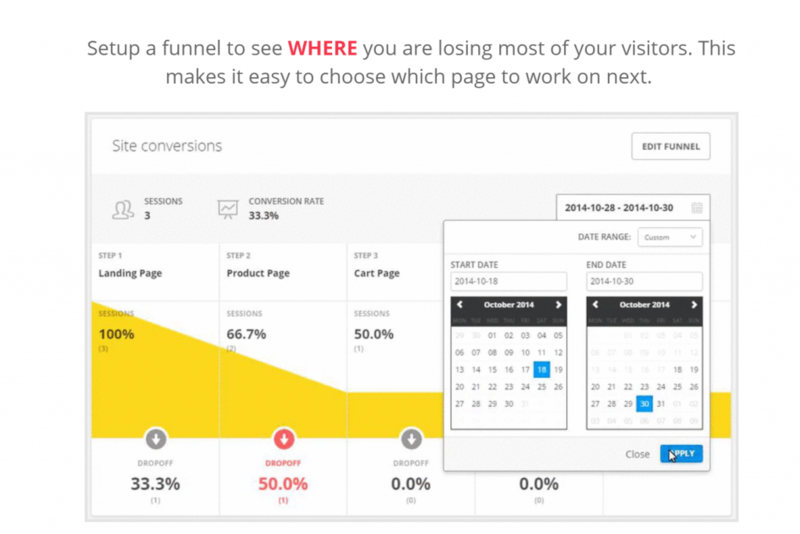 The funnel feature of Hotjar allows you set up and monitor visitor completion rates for a user journey of up to six steps. If you have a transactional site this can be especially useful feature as it allows you to track users through the purchase process and identify the biggest drop off points in your funnel. If you have any kind of form, whether it is registration form or check out process, this feature allows you to track visitors as they proceed through the journey and identify when or if they drop out. For example, if you have a registration form for your site you may find that a username question causes a lot of drop offs and prevents visitors from signing up. This might be because many of the obvious usernames have already been taken. 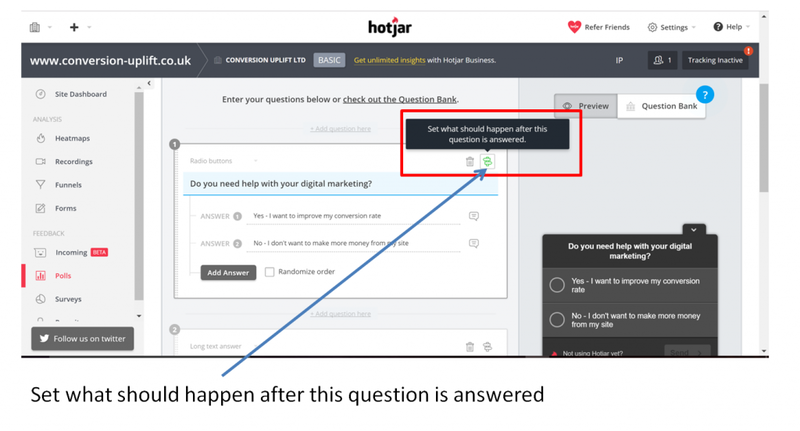 This is such a great feature of Hotjar as it allows you to engage with visitors and ask a few simple questions about the user experience whilst they are on your site. The first time I used a poll I asked visitors to the homepage of gaming website “What is missing on this page?” We got lots of mobile visitors saying that they couldn’t see the login box or that they were unable to login. On checking the homepage with a mobile device we discovered the login box had been hidden by Marcoms for mobile users as they wanted them to encourage them to download the app. Unfortunately these users were existing customers who already had the app and needed to login to their accounts to verify their details. Because we got the feedback from the poll we were able to rectify the problem immediately. When setting up questions you can also specify where respondents should go next dependent upon their answer to a question. This ensures that respondents are only asked questions that are relevant to them. 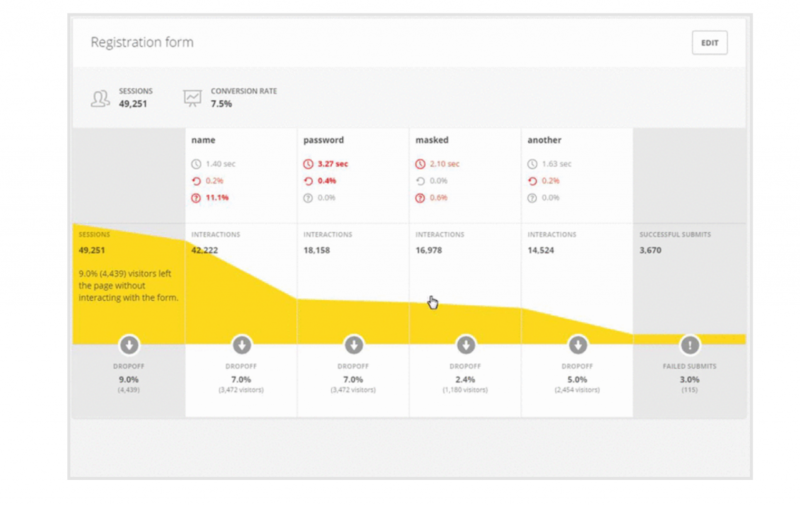 This allows you to design longer questionnaires to email to your customers for more in-depth feedback. It’s a great way of engaging with your email list on a regular basis to gather their views on a variety of topics. At the gaming company we surveyed new customers to find out what had most appealed to them about the site to see if our value proposition was aligned with customer perceptions. We also asked them if they played on any competitor sites to understand who we were competing against. You have the same selection of question types to choose from as you have with the polls feature. Hotjar recently added a new feature in beta – called incoming. This is a “Feedback” tab that you can place on either a specific page or your whole site to allow visitors to rate the user experience. I’ve only just stared using this feature and so it’s too early to say how it has been received. However, I think it’s great to show you encourage and value visitor feedback as this can improve the perception of your site as a whole. If you want to conduct usability testing Hotjar has a recruiter feature which allows you to collect profiling information and contact details in exchange for an offer of a gift to incentivise the process. 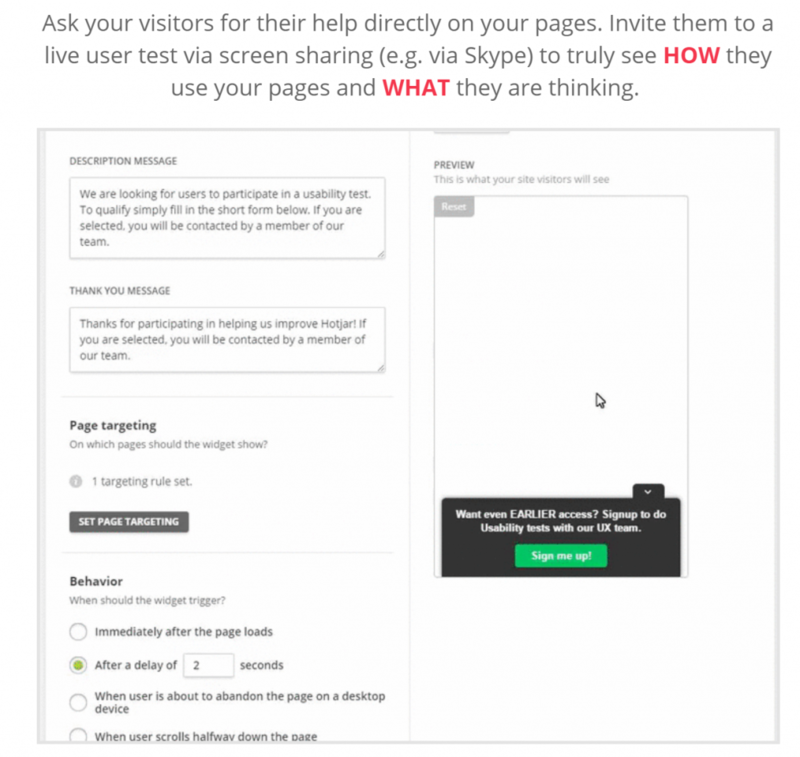 You can then arrange to conduct a usability test by sharing screens using Skype or another web meeting solution. This is a great feature of Hotjar as it’s important to keep in touch with your users and regularly review your website user experience. This is especially relevant when you re-design an area of your site or add new functionality and you want to understand how well visitors use the new pages or feature. For many small to medium sized businesses Hotjar offers an amazing solution for little or no cost. However, it does have its limitations and there are areas for improvement. The free plan does limit you to just three heat maps and 1,000 page views per heat map. If you up-grade to the Plus plan this rises to 2,000 page views and the Business plan gives you up to 10,000 page views. Unlike more expensive solutions Hotjar does not allow you to filter your heat maps according to visitor type (i.e. new or returning visitors). This can be very useful as the behaviour of new and returning visitors often reflects different user goals. As Hotjar is a relatively new tool they have concentrated on improving functionality rather than integrating with related solutions. This does mean that Hotjar does not integrate with many testing, web analytics or CRM solutions. Some integrations are available, notably with Hubspot, but most are not available at present and this is a major drawback for any site conducting online experiments. The conversion funnel also lacks a level of sophistication. For many sites users can’t be expected to follow a simple sequential funnel and so the ability to create multiple route alternatives would be a benefit. However, Hotjar do have a full product roadmap to further enhance and improve the functionality of the solution. If they can also integrate fully with complementary tools this will be a big improvement. 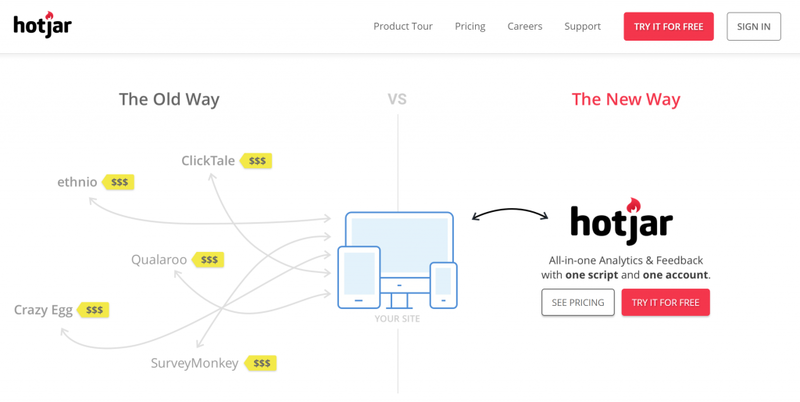 For many organisations Hotjar is an ideal behavioural analytics and customer feedback tool. For start-ups like my business Hotjar offers exceptional value for money. I can’t afford a significant subscription and my traffic levels don’t justify it. Hotjar meets an important need for online businesses. If you are setting up an online business then Hotjar is a no brainer and even if your site is established it is still extremely good value for money. Customer feedback – How to use online Voice of Customer tools to boost conversions..
You can view my full Digital Marketing and Optimisation Toolbox. Dark UX or Persuasive Design?